At one point I'm having a list of DateTime and I need to figure out if this list contains specific date or not. For that I m trying use Any() on the list. Even if the list does contain the desired date, Any() returns false only. Following is example code, which also have same behavior. So if I can get any idea on this code, I guess it will help on my real code too. This will make the Ticks and TimeOfDay properties of your dateNow equals to ones that you've added to your dateTimeList. There's a saying in computer programming "select isn't broken". It means that when some basic, commonly used, heavily tested bit of software seems to be broken, the problem is that you've misdiagnosed the problem, not that the tool is broken. The mistake is that you are rounding the date correctly in one place and incorrectly in the other, and the incorrectly rounded date is not equal to the correctly rounded date. Use the Ticks property on the dates to see why one of your rounding techniques is good and one of them is totally wrong. The key to finding out why this happens is finding out what's the difference between the two DateTimes that we are comparing. The one above is the dateNow and the one below is the one in the list. See the difference? dateNow has more ticks than the one in the list. 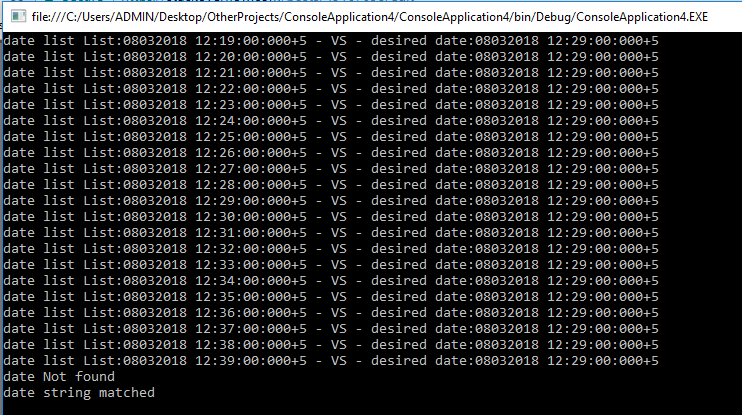 The DateTimes in the list are created from date, which is created by using the constructor with 6 arguments. This creates a DateTime just as you specified. This means that the instance created will not have any extra ticks for the "remainder". And I can see that when you change your dateNow, you tried to remove all the extra components that you don't care about, like seconds and milliseconds, but you forgot about ticks. When you compare 2 DateTimes you are actually comparing the ticks. So you need to remove the extra ticks from your dateNow to get your desired result, or just use the 6-argument constructor again. Your synchronization with AddSeconds and AddMilliseconds works to the precision of fff (milliseconds) but not to the precision of Ticks (one ten-millionth of a second). The latter is required for the DateTime equality that Any() uses. Precisely sync the DateTime copy with its prototype by creating that copy with the DateTime constructor that takes Ticks. Then your code accurately finds the date with Any(). Here is your improved code as a working Fiddle. We can format a date string to the precision of ticks by using fffffff instead of fff. Not the answer you're looking for? Browse other questions tagged c# .net linq datetime or ask your own question.